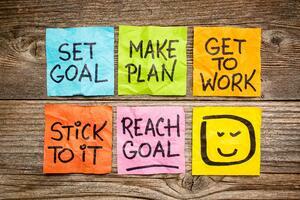 Practical tips for setting meaningful goals for your FEC. The holidays sure are busy, aren’t they? Navigating all the festivities and facility park events along with your family obligations will no doubt require some major juggling, but hopefully you’ll be able to take some time to relax and enjoy it. With the new year approaching fast, it’s time to nail down those 2019 goals so you can hit the ground running in January. But setting and achieving goals are often easier said than done, so we’ve provided five tips to help you craft or refine your 2019 FEC goals to turn them into a reality and keep you from failed resolutions. You might be a brilliant independent thinker who has built your concept from the ground up all on your own, but you could be missing out if you try to write your FEC business’ goals by yourself. Many of the best leadership teams spend time bouncing ideas off each other, offering perspectives and strategizing approaches to accomplish. Not only can department heads and other park leaders provide key insights from the trenches, uncover challenges and think creatively, but you know that (at the very least) you need their buy-in to carry out your organization’s goals with their teams. The more invested leaders — and individual team members for that matter — are in the process of setting department or organizational goals, the more willing and able they’ll be to work towards them. You’ll likely have goals for areas such as sales, marketing, guest experience, maintenance and safety, personnel management and more, so be sure that you’re opening yourself up to hear from the people in the trenches so that your FEC business has the right focus in the right areas. Have you ever set a sales target that a team missed by a mile, only to learn that they didn’t feel like it was attainable from the beginning? Chances are, you missed a critical piece of the puzzle by not involving them early enough in the planning. To set the stage the right way, consider scheduling (and communicating) a goal-setting meeting within the next two to three weeks. Offsite meetings are great formats for these because they allow for fewer distractions. Consider at least a half day, if not one to two full days for this meeting. The time won’t go to waste. You’ll need flip chart paper and fresh markers, large sticky notes, notepads and pens, and any audio/visual materials, such as a projector. Offering the team catered meals, snacks, cold drinks and lots of coffee will help you keep a tight handle on the time you’re together, while still affording you some breakaway time, such as morning or afternoon short breaks and lunch away from the table. Share anything they need to be prepared to make the most of your time together. This can include year-over-year sales trend data, guest satisfaction trends or a heads up for any other key issue or obstacle you believe the organization is facing. Be ready to share your overarching vision, values or mission in order to set the year off right. 4. Facilitate a productive meeting. From there, elicit each leader’s contributions of successes, recommendations for goals and key initiatives, and talk through the challenges to come up with a strategy for overcoming them. Then, as a group, you’ll be able to agree on the top goals for the year (broken down by quarter and/or by month if desired). Be sure to take notes so that you can capture who’s responsible for what, and by when. Afterwards, consider keeping them in a place where everyone can access them and report on progress. This is key to developing goals that are SMART (specific, measurable, attainable, relevant and time bound). 5. Put the plan into action. It’s easy to let the momentum of a FEC planning session drift away if you don’t have clear next steps. I recently conducted an informal survey on social media asking what people felt like they needed help with, and over and over I saw the need for an understanding of how to prioritize the top tasks/goals. Ensure that you agree on the most important tasks and that leaders feel confident that they will be able to complete the tasks necessary to achieve the goal. Consider asking a pointed question such as, “what do you see getting in the way of meeting the milestones of this goal?” so that you can understand potential obstacles. Candid conversation is critical during this process so leaders raise potential impediments to be discussed and prepared for. You don’t want to be eight weeks into the new year and learn that someone has made no progress because they didn’t know how to get started, for example. The more trust and teamwork you’ve fostered, the easier it will be to have this kind of honest conversation. When you’re first starting out, it is often helpful to brainstorm the steps to the goal either chronologically, or by envisioning the desired outcome and working backwards, says success guru, Jack Canfield. If you haven’t read Jack Canfield’s, “The Success Principles” — it’s one of the best books on setting and achieving goals available. What’s important is that everyone responsible for an initiative has the clarity and confidence to know what must happen next. There are many ways to set and achieve meaningful goals, and this is just one way that can provide you with a framework to allow you to analyze any area of your business and set out on a plan to improve and grow. What challenges have you had to overcome when setting or achieving goals? Share them in the comments or on Twitter. Looking to grow your sales as one of your FEC goals? Read our blog: How to Overcome Sales Growth Obstacles in Your FEC.